We are a leading Importer of Titanium Sheet from Delhi, India. 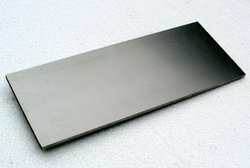 We have emerged as one of the recognized enterprise, widely engaged in offering a broad gamut of Titanium Sheet. These Titanium Sheets are checked by our quality controllers on different parameters to assure its faultlessness from our side. Our respected clients can purchase these titanium scraps from us in a confine time frame on several specifications. The offered titanium scraps are manufactured from optimum quality material & innovative techniques in accordance with the set standard of industry.